Richard Irwin (Belper, United Kingdom) on 24 June 2008 in Plant & Nature. Red bananas showing an incredible vibrancy of colour. very cool! I did not know that red bananas existed. @Rags: Its funny what you can find, I didn't until I spotted these, now I'm seeing them everywhere !!! I've never heard of them before. I've learnt something new and it's only 8 o'clock in the morning. Nice photo. @Mike: Ha ha, nice one. The funny thing is, after taking this shot (in a tropical greenhouse), I found Red Bananas for sale in my local supermarket. I just had to try them - very very sweet, but a bit softer than normal bananas. They certainly are a beautiful shade of red! Nice macro! Wow!Wonderful color!Are they really red? !Can`t believe it!Superb! 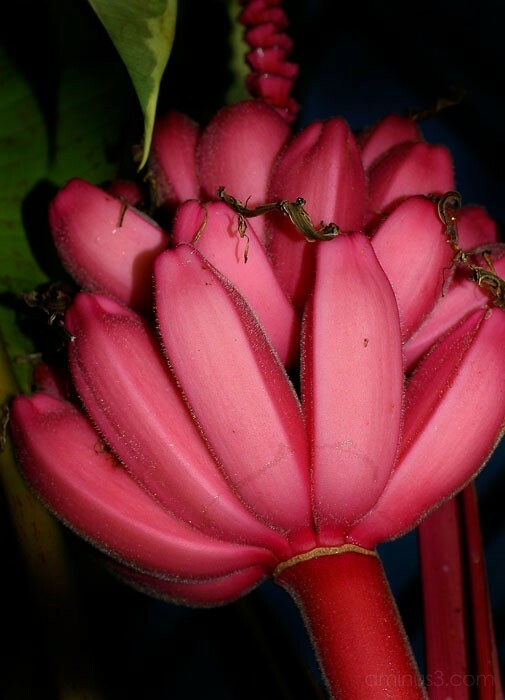 @shahab: A very deep shade of pink, and the bananas inside also had a pinkish look. Wow! you find the most unusual things, what's crawling on them? If it was 1st April I'd say it was a joke :) Never seen or heard om them Richard. I have seen pot bananas growing in Tenerife, just like a small shrub. Good detail and color, and interesting to see. I have never seen those before! What a great color...what do they taste like? @Jen: Very sweet, but in my opinion a bit too sweet, and I prefer a normal yellow banana. I did not know that red ones existed. But now I know. something new each day. They look like the buds on my honeysuckle, a great close up shot Richard. I did spy these in Sainsbury's but didn't have the nerve to try them at the price they were selling them at lol. @MaryB: I'm afraid you would have been disappointed, I bought some in Morrisons, and they were no match for yellow bananas in taste or texture.